With days passing by we are becoming more dependent on our tiny devices called mobiles. From shopping to traveling, looking for properties to booking an appointment with a doctor we nowadays prefer to do all these works just within few clicks of our fingers. Hence nowadays every industry that you can think of is going after mobile apps. A. Banking & Financial organizations are offering internet banking (i.e. City Touch), corporate banking apps, FDI automation apps etc. B. E-commerce industries are quite unthinkable without a mobile app today. C. Real estate companies and marketplaces are also going after mobile apps for a new age business (i.e. pbazaar). D. The retail industry is also going after mobile apps. E. Travel agencies are adopting mobile apps for their customers to book their travel destination easily and smoothly. F. Hospitals are adopting mobile apps for their patients to book an appointment of a doctor more easily nowadays. Therefore, patients now don’t have to stand in a long queue to get that appointment which is not only making things easier also saving a lot of time. G. Agro businesses are using mobile apps for rain forecast, harvesting guidance etc (i.e. Fosoli). H. Education is also after mobile apps for making education easily available to everyone. I. “Shared Economy” businesses i.e. Uber, Patho, Airbnb are quite impossible to think off without a mobile app. J. Restaurants and food serving or delivery industries are into mobile apps. K. Entertainment & media industries are also into mobile apps. So you would hardly find any industry which is not into mobile apps nowadays. Many industries have even been disrupted by mobile apps. For example, think about telco industry. The telco industry is one of the earliest industries that got disrupted with a variety of mobile apps for messaging, chats, video calls etc. ( WhatsApp, Viber, WeChat, Telegram, and Facebook Messenger). The ability of such apps enabled communication via messages challenged the dynamics of SMS services and apps like WhatsApp, Viber, Facebook messenger etc. have gone a step further by enabling voice calls and even video calls to become a highly disruptive force for the telco industry. Mobile app payments, wallets etc. are pretty common these days in banking & finance industries. Transportation industry got a paradigm shift after peer to peer ridesharing platforms got in. So if you would look carefully you would be able to see how businesses do work these days and how mobile apps have a lot to contribute in the businesses. Now, it’s pretty basic stuff that business is all about profit. And profit comes from more sales and sales generates from more customer engagements. Hence these days all the business do focus highly on reaching & engaging customers besides their product quality assurance. Now let me elaborate on how mobile apps will help you ensure all these items for your business. A global statistics on mobile app of $72 billion by 2020 has been forecasted. Which implies a huge amount of purchasing power with which businesses can take it to next level. Increasingly, consumers are looking to purchase products within an app rather than a website on their computer or mobile web browser. Therefore, it’s easier for organizations to boost sales and revenue through an app for their customers. Whenever a fast and easier way is there for your consumers to access your products, services, and contact information. Be sure of the fact that it will improve the engagements 10 times and you’ll be able to reach more audience which will turn your audience into your customers. A mobile app thus places that information right in front of the consumers and not only that, apps can provide a stronger customer service and opportunities, it will also help you to gain more customer insights using analytics from the app. Analytics from the mobile app is undoubtedly one of the greatest features and by using those valuable data businesses can lead to smarter investments and can increase their ROI. So, businesses in every industry to stay ahead in the game and to outrun their competitors are adopting mobile apps. Whether a business is small or big in size, the mobile app can create a lot of impacts while it’s a question to increase profitability and revenue. More than 140 million people use a mobile phone in Bangladesh according to 2017 statistics while 80 million got access to the internet. So, what does this mean for businesses today is, now more than ever businesses are getting benefited from mobile apps. If we look into the banking sector, banks with mobile apps are triumphing in the market while their competitors are losing clients just because of not having internet banking facilities or mobile banking. Some industries like e-commerce are swamped with mobile apps. But what makes difference in their competitions is the app that is full of features (simplest yet magnificent) that serve. So accept it. 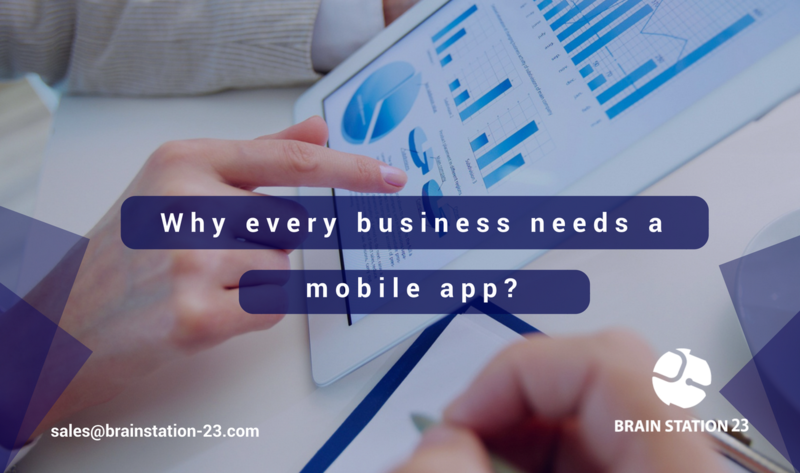 You need a mobile app to take your business to next level. But where to get the app from is the question. Before you go down the path there are some points you should consider before jumping in and creating an app for your business. Will you be storing customer details and purchase history? Will different departments need access to different information? Will you be managing employee daily tasks and want that process to be automated? You should have a clear idea about the exact pieces of data you need to collect and why they are needed to meet your overall business goals. From do-it-yourself platforms to hiring developers for building your custom app, choosing the right platform that caters to your organization’s needs is always the most important consideration. When you’ve already taken the time to determine that information you need to meet your business goals, then it’s time to take a look at the platform itself. Is it easy to use and get started? Is there good customer support to help you along the way? Will it allow you to easily and quickly put together your application without needing extensive help at every turn? Besides, always consider the overall price of developing and maintaining your application. And never be afraid to ask questions if you don’t know what could hurt you in the long run. And take a good look for terms and conditions pages and feel free to ask about future pricing. Can the app scale with you and your company as needed? There are many third-party applications that you would like to integrate with your app? Will you have access to new features and benefits without additional cost? As your company grows, your application should be able to grow with the company. Your app should have the flexibility to handle growth in any area of your business without a downtime to integrate the tools. Thus, get a complete idea about what to expect and how to grow with the platform you choose. Now, the most important part is to choose a partner to build your custom mobile app. A professional team of app developers or a good app development company who has got industry knowledge is the one you should choose as your app development partner. Cause in the long run not only they will save your money & time with on time & proper delivery but also will be able to guide you to adopt the newest technologies which will help your business to go to next level. So for today, I would like to draw a conclusion saying that businesses nowadays are driving more sales with mobile apps as we (the people) are becoming more mobile dependent. And if a business wants to grow it’s inevitable for them to have the right app for the business and to choose the right partner for the app development.